Jalebi is a dish that is loved across India!!! 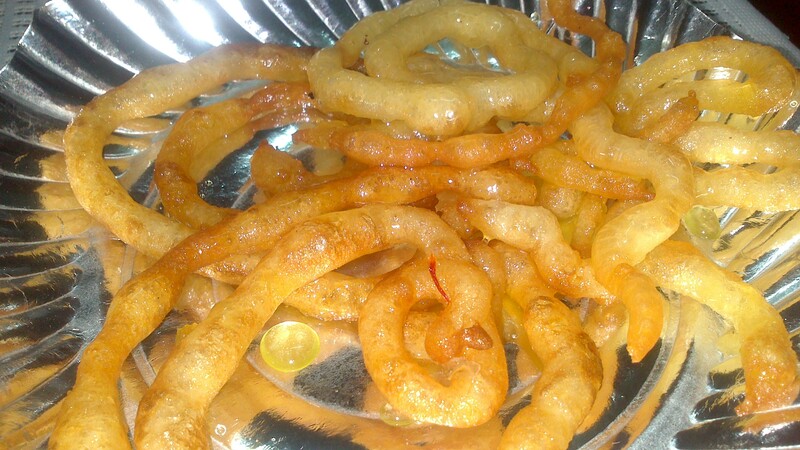 So, when i saw Jalebi’s recipe in a newspaper long back, i thought it’s so easy…Why doesn’t anyone make it at home?!? Well, i tried it and came to know “Why”….Though it’s very quick to make, it’s not as easy as it looks. So 1st time i tried it (4 years ago), in place of Jalebi, i got Boondi!!!! It tasted good but the shape was all messed up. So i gave up on Jalebi…. I realized that here, consistency is the Key. The batter should not be too watery at the same time it should not be too thick. And next time i made it, i could manage decent shape as well!!! Here is the pic!!! As i said, the recipe is from a Neeta Mehta cookbook, this will make a lot of Jalebis, if you are making for 2 people then please use half the quantity. 1) In a mixing bowl, take Maida, Besan and Soda. 2) Add thick curd & oil. (I have realized that if you use 1/2 days old curd just out from the fridge then it gives better results). 3) Now comes the consistency part, so very carefully, add warm water to the mixing bowl. 5) Cover it and leave aside for 30-40 minutes (Don’t skip this, it is important). 6) Heat oil in a kadai. 7) The book says that using a piping bag make circles (from outside to inside) in the hot oil. Initially i used my Sev no sancho (Sev maker, Kitchen Press or whatever it is called) to drop jalebis..It gave me okay results. Later i put the batter in an old hanky and made a hole in the center (to get a potli like thing) and it gave me correct shape. 8) Fry the Jalebis in the oil till they are the heavenly golden coloured, like a jalebi should be 🙂 take out on tissue paper. 9) Meanwhile make Sugar syrup. For that Mix water, sugar and saffron strands in a kadai and heat. we have to get the syrup of single string. For that after the 1st boil, keep the flame low and keep stirring for 5-7 minutes. 10) Let the syrup cool for a minute and then dip Jalebis in the syrup (Don’t dip all of them together, do in the batch of 3-4 Jalebis at a time) and serve hot!!! 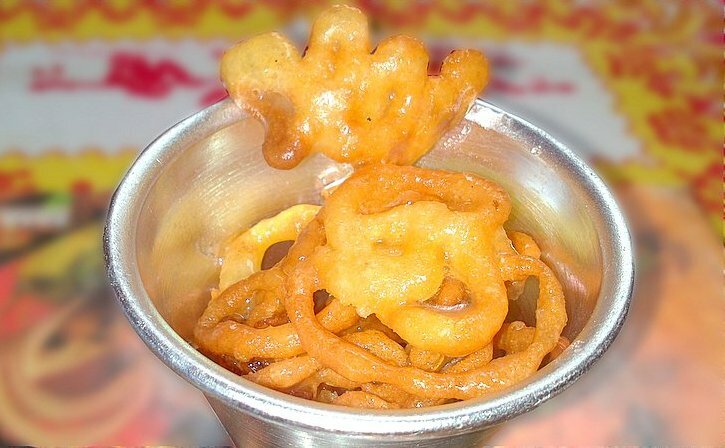 1) Dip the Jalebis in the syrup only when you are ready to eat them. 2) Make the syrup only when you are ready to eat Jalebis as the syrup will become thick after some time (though you can heat it up again on low flame, but still it is good to make fresh syrup). Try it out, it's really easy and sooo yummy! !